Access to reliable information, including on changing weather patterns and market conditions, is essential for empowering farmers, especially those in developing countries, according to FAO Director-General José Graziano da Silva. The G7 countries–Canada, France, Germany, Italy, Japan, the United Kingdom and the United States–can play a leading role and help promote more resilient and a more sustainable global agricultural and food systems. “There is an urgent need to take the data which is available globally and to translate it to the ground level,” Graziano da Silva said in remarks made during a G7 Agriculture Ministers meeting session entitled Empowering Farmers. Farmers, especially smallholders and family farmers in developing countries, incur much of the impacts of climate change and other shocks including price volatility. This at a time when, for the first time in over a decade, estimates show that hunger is on the increase with 815 million people suffering from chronic undernourishment. 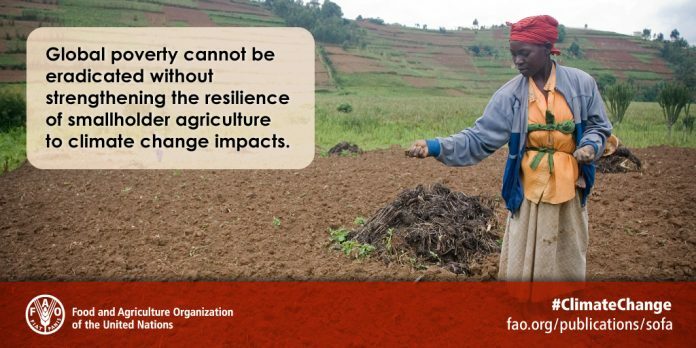 The FAO Director-General noted that building the resilience of farmers to extreme weather events linked to climate change, including droughts and floods, also requires making better data available to more people, especially those living in poor and often remote rural areas. FAO is working with the World Meteorological Organization to better respond to climate variability and climate change on the basis of better and more readily accessible data. Some 75 countries mainly in Africa, and many Small Island Developing States, do not have the capacity to translate the weather data, including longer-term forecasts, into information for farmers. Improved access to quality data plays a key role in combating hunger and poverty by providing farmers with vital information, including on access to food and other agricultural products. Local purchases from family farmers creates markets and helps to improve the quality and supply of food, said the Director-General. This is also vital for building resilience and strengthening livelihoods by disseminating information on income generation opportunities, in particular to empower poor women. It is something that can be done relatively simply through the use of mobile telephones, working with the private sector in the development of mobile phone apps that provide market information.